One of my most favorite tools I have never owned or even used is the Makita 18-Volt LXT Rotary Hammer. Just thinking about all the time I could save on a door job with one of these, makes me want to go out and buy one. Frankly, Makita can not be beat when it comes to the quantity of 18-volt lithium-ion tools, and the new BHR241 rotary hammer is just one of over 35 Makita LXT tools. The BHR241 is not the first LXT rotary hammer from Makita, but they know there is always room for improvement. 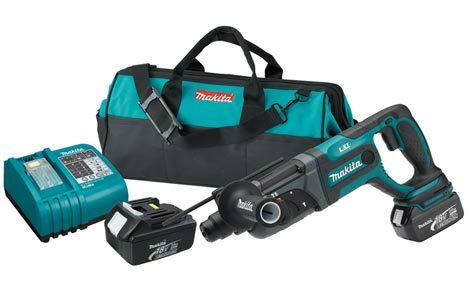 According to Makita, the new model is more durable and offers a shock absorbing handle that reduces vibrations. Less vibrations are not only better for the battery, but it also means you get longer run times. The BHR241 uses a Makita-built variable speed motor that delivers 1-1,00 RPM and 0-4,000 BPM. It has the 3 modes of operation we have come to expects from all rotary hammers; rotation only, hammering only, and rotation with hammering. It also has a built in clutch that reduces gear damage by disengaging if the bit binds. The new roto hammer can be purchased as tool only (model BHR241Z), or as a kit (model BHR241) with 2 batteries, 30-minute charger, depth gauge, side handle, and contractor bag. JULY 20, 2010 La Mirada, CA – Makita, a worldwide manufacturer of technologically advanced power tools that are more compact with less weight yet deliver industrial strength power and results, is proud to announce the release of its new 18V LXT Lithium-Ion Cordless Rotary Hammer Kit, model BHR241. The new BHR241 features a new shock absorbent D-handle design, and combines speed, power and comfort with less vibration for a range of concrete drilling applications. "Makita knows concrete, and with the addition of model BHR241 we continue deliver more solutions for concrete contractors," said Ethan Haughawout, Makita's product manager – cordless products. "With the BHR241, we took our previous BHR240 model and made it even better with a more durable jobsite-tested shock absorbent handle to protect the battery housing by reducing vibration. We made great rotary hammer even better." The new BHR241 has a Makita-built variable speed motor that delivers 1-1,000 RPM and 0-4,000 BPM. It has a 3-Mode operation for "rotation only," "hammering with rotation," or "hammering only." The built-in clutch reduces gear damage by disengaging gears if bit binds. In addition, there is a one-touch sliding chuck (accepts SDS-PLUS bits) for easy bit changes, and the chisel rotates 360° with 40 different locking positions to get the best working setting. The hard-hitting BHR241 has enhanced durability features, so the tool beats up the work surface – not the tool or the tool user. It has an ergonomic grip with a soft-grip handle, and a jobsite-tested shock absorbent handle to protect the battery from excessive vibration. This new feature is engineered to reduce vibration and extend the life of the battery. "We took the same shock-absorbent handle design from our BTW450 half-inch high-torque impact wrench and added this to the new BHR241 to reduce vibration transmissions from the tool to the battery terminals," said Haughawout. "The end result is less vibration on the battery, providing even longer run times." The BHR241 is powered by Makita's 18V LXT Lithium-Ion Battery Technology and Rapid Optimum Charging System, a breakthrough in cordless technology producing 430% total lifetime work with two-and-a-half times more battery cycles when compared to traditional 18V Ni-Cd batteries. The Rapid Optimum Charger is ENERGY STAR qualified for its charging efficiency, and will charge a Makita 18V LXT Lithium-Ion battery in only 30 minutes.